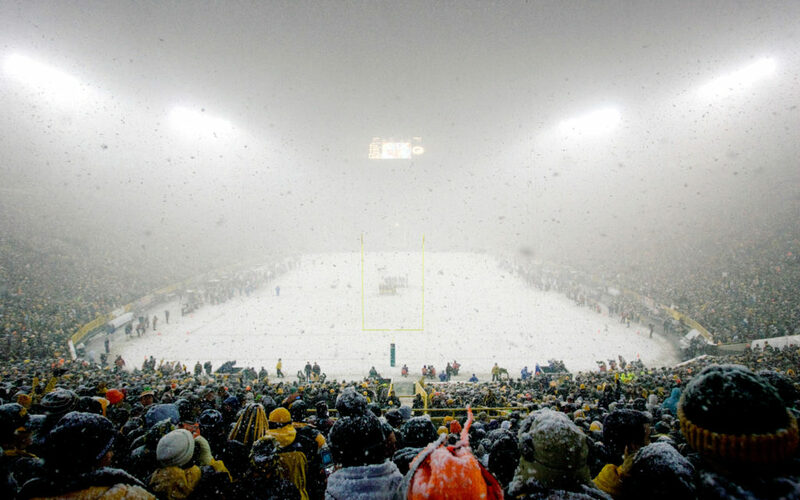 Every football fan should go to Lambeau once in their lifetime and every 8 years Dolphins fans get the chance to see their team play in the football world’s Mecca. As soon as the schedule came out a group of Dolfans NYC members set our plans in motion. Since then our group has grown and I found out that a bunch of our other members were going as well. When I mentioned we were going on Twitter Dolphins fans all over the country reached out to me about what we were doing for a tailgate. Well, we have finally figured that out! Former Palm Beach Post Dolphins writer Andrew Abramson reached out to me about a friend of his living in Wisconsin who had a perfect spot for a tailgate. Andrew was a #MetLifeTakeover regular when he was covering the team and knew we were going and wanted to connect. He put me in touch with his friend Ace who got us access to a store called Extreme Audio (757 Mike McCarthy Way) that is only one block from the stadium! The store acts as a parking lot for Lambeau on Game Day, but the owner is willing to sell us the parking spaces in advance. Between Andrew, Ace and Dolfans NYC we have purchased 6 spaces that we are going to leave empty for the tailgate as well as a couple of spaces that we are going to be parking in. If you want to park in the lot as well (way cheaper than actual Lambeau parking) email ace@extremeaudio.com and let him know ASAP. There are only about a dozen spots left so first come first serve! As far as the actual tailgate goes, we will be kicking off at noon, with the game starting at 3:25pm we should have plenty of time to pregame. We have 50 burgers, 50 brats and some vegetarian options. We are gonna have some beer and water, but please BYOB because we aren’t going to have enough for everyone. The tailgate is technically free but we ask everyone to make some sort of donation. After we recoup the funds we spent on food/parking all left over money will be donated to Toys 4 Tots. You can also bring an unwrapped toy as payment as well. Extreme Audio does a Toys 4 Tots fundraiser every year so we figured this was a perfect way to thank them for hosting us and to do some good for the Green Bay community. 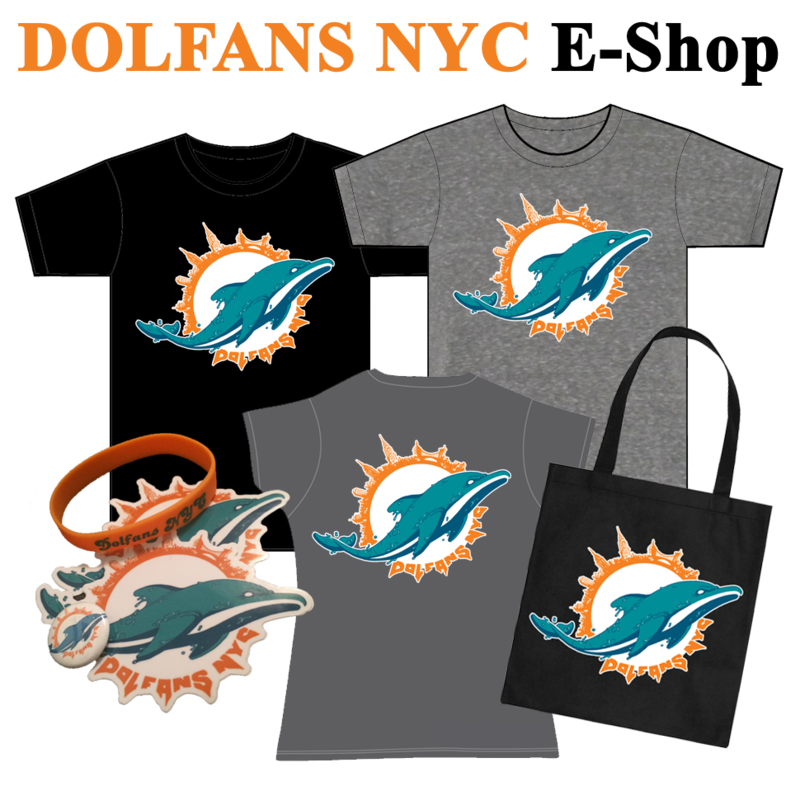 If you want to donate directly please PayPal us at dolfansnyc@gmail.com. I think a $10 per person donation would be perfect. 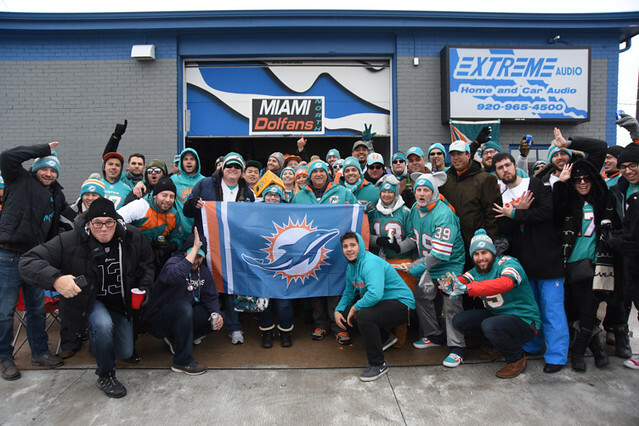 So to sum it all up, every Dolphins fan is invited to party with us before the Green Bay game. If you want to eat our food bring $10 or a toy for the charity drive. If you want to park near us make sure you email Ace ASAP. And if you want to drink, please BYOB. Obviously anyone who wants to bring other snacks and stuff we would love it. This should be an amazing experience no matter what happens on the field. Stay warm out there! Anyway, I got a new camera this week and it is very small but still high quality so I don’t have to lug my serious camera around with me anymore. I didn’t take a lot of shots on Sunday but there were some good ones. Check the slideshow below and as always if you want to download a photo just double click on it and it will take you to the Flickr page. Hey guys! I hope you enjoyed the break from football as much as I did. After having my heart broken two weeks in a row I have pretty much avoided everything Dolphins for a while. I just couldn’t take it. But I am officially back on board. The Dolphins are 2-0 on the road and ready to make it 3-0 against a banged up Packers. It looks like Aaron Rodgers is going to play but Clay Matthews is doubtful and Woodson has a toe injury which is never a good injury for a DB to have. On the Dolphins side we are the healthiest we have been all year coming off the bye week. Looks like Odrick is still out, but we finally get Crowder back and John Jerry is at least going to be worked in. If the Dolphins can hit Rodgers early (and Cam Wake should have a day with RT Mark Tauscher doubtful) I think they have a pretty good chance of taking the upset and getting back on track. And I pray they do because I can not take three straight losses. We need this game. I am excited to see everyone at Third & Long (35th and 3rd Ave) this week. We should have a little more room to move around at the bar this week since it is not a big division game, but I hope to see the place pretty packed anyway. I know that anyone who can manage to be a Phins fan in the middle of Jests country can’t possibly be a fair weather fan. We aren’t doing a raffle or anything this week, but we still have drink specials if you are wearing Dolphins colors and as always we will have sound and the game on more than half the TV’s in the bar. I can’t wait! Go Dolphins!